All the joy of renovating our house without lifting more than a clicking finger. Desire to make Atomic Indy more interactive. No longer just readers. Join in our mid century modern renovation fun. Several posts back left you with stained birch wood panels lying on basement floor. Panels have since been installed. Questions of how they integrate with overall direction began to arise. Come and play. Below are three options. Some quick dirty Photoshop to illustrate point. The results of this survey will help shape Atomic Indy. Survey tool is top right of this post. Have had several request for additional images to offer more context. Bear in mind this is an extensive renovation therefore context is evolutionary and undefined. Island filler may aid in such definitions. Have included additional perspectives below. Each requires explanation. Disregard wall colors. We have not yet begun to paint. Example of aforementioned undefined context. View back to shoot location of original image (looking to the right from behind island). Table and chairs will have rug with which to rest upon. Chair cushions will also be replaced. Context can be created in such textiles. View looking to left from behind island. Space behind doors will be closed off and opened up on other side. Wood doors are stand-in representations of birch wood panels. Spending a couple weeks living with what it might be like to take context of birch throughout. Each panel would have aluminum reveal between. Option to put up drywall instead still exists. Note celestory windows above have been covered over. Will return these to glass, allowing natural light to enter office. View from couch back to kitchen. Glimpse of how birch context could carry through. Wood panel along left back wall is representation of floating shelving currently drawn up in my head. Stools will be refinished in white. These images explore the birch context. This is not intended to sway votes. Merely our attempt to get a sense of how one of the options could be carried through. Okay, not *all* wrong. I really dig the floor idea. There's a certain magic cohesiveness to it. However, it looks a little one-dimensional. So I think you should install a wood strip under the counter and put some rope-lighting in behind that to shine back down on the wood flooring. This will give it the "pop" I think you are looking for but keep it cohesive so it stands out, but in a good way. I happen to dig the orange! I wouldn't go with the floor color. I don't have a real idea of how big the space is, but it could really darken everything up and make it feel smaller. I like the orange scheme and the natural birch idea the most. I use alot of birch ply in furniture, so I'm a little biased. Ok....maybe "you got it all wrong" is a little harsh. To me, seeing the area that the kitchen opens up into...what's going on in that space might dictate to some degree the best approach to the counter fill. Then again...maybe "I got it all wrong???" As its been said, Without seeing what the kitchen opens up yo, it's hard to say. 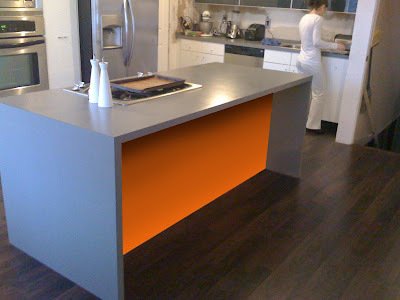 From what I can see....the birch and orange really relate to no other visible elements and running the floor color up the island creates an odd visual effect. Have you considered matching the island to the WHITE cabinets I see on the right hand side pf the kitchen. From what I can see, that's what I would do. Orange, definitely. it makes the grey-blue counters pop, and you can change it easily to lime green or turquoise or whatever mood strikes you as the season change! This is the great thing about paint, and *especially* in a confined area like that one panel surrounded by other amterials. I have a personal dislike of the flooring surface in a Kitchen being used ANYWHERE but the floor, as when the flooring material approaches a food surface it seems...icky. And it's not like I'm a germ-o-phobe, I'm a big proponent of the 3-second rule! But I think the flooring material, specifically in a Kitchen, should be viewed as a separate material treatment from anything else. Not the floor color, but without seeing the space it faces, too risky to render opinion. Does the orange or birch relate to the unseen space? 2. It is too reminiscent of bare plywood, which I often love, but with your pristine white and grey cabinets it's looking unfinished, and is also (for me) reminiscent of mid-90s DIY instead of mid-50s zootiness. 3. the panelization of it is not complementing the homogeneity of the cabinets (does that make sense? I like how the orange reads as ONE panel, while the birch reads as four). I like the orange.. but to echo some of the previous comments, it's hard to make the call without seeing the entire room. Have now updated post with more images offering context to the rest of the space. Appreciate all your comments and votes. Keep 'em coming. Thanks for the additional images - now I'm even more sure of my preference. 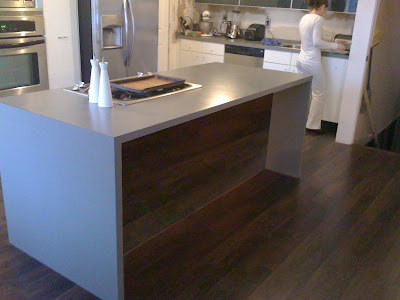 With the birch door/panels nearby, a birch panel under the island is too "matchy-matchy", if you know what I mean. Like matching gloves, belt, and purse (which was, to be honest, a popular fashion look in the 50s). As I often say to folks (including myself) the problems you are facing are the result of previous decisions. In this case the floor. It's a road you went down early, and it is now effecting everything. The dark walnut floor is just not very MCM. Not like the birch anyway. I do think a color would work here. Because that area will see some kicking, I might suggest formica. Another obvious choice would be stainless. On the closet wall, you might consider, instead of just aluminum strips, the ones redneckmodern used. They hold shelf brackets. Then walnut panels? I also like grasscloth. This would give you rich surface and texture and still be light. White formica. Post a picture with the white if you can. I disagree about the floor. It's a beautiful choice and let's remember the idea behind modernism, it's not museumism. I have a thing for the orange. It's a nice pop of color and contrasts well. Then again, we're using a similar orange in our house so it could be bias. Can't wait to see it! Super shag carpet in bright red. I love it that you are doing this poll as I am struggling with the same design question in our new island/ bar area. Personally, John and I both like the orange in your island. In our kitchen, we had been considering matching the birch Ikea cabinets that will be installed but this seemed like too much birch everywhere. A friend has suggested the rope light idea to us as well and I think it's terrific. Same friend suggested covering the front of the island with the same tile we will use for our backsplash. However, I was going to go for a pretty wild mosaic-y tile and this would be too much so I am now considering just doing a strip of tile? in the birch? Don't know but I need to play around with photoshop like you did. I never thought of just painting it a color but that is my fave, followed by the birch. i'd go with "2. Flooring continued up inside of island", especially with the barstools refinished in white. Orange. But change the stools to a bent wood style that its the same color as one of your other two woods. It will look more intentional and the pop color adds interest. Also, down the road you can still change it to any other pop color that suits you. Over a year later.... so what did you choose? It's a constant evolution here at Atomic Indy HQ.